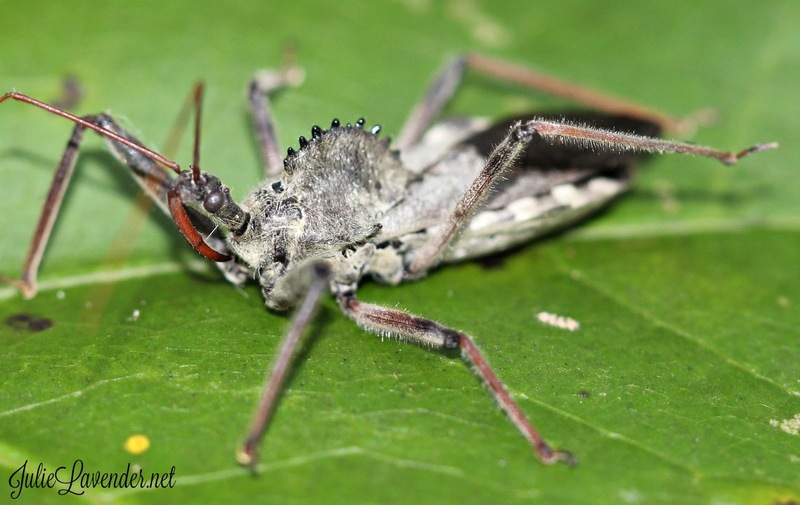 The oddly-fashioned wheel bug is a type of assassin bug. An assassin bug preys upon and attacks a wide variety of insects and other arthropods in a rather gruesome manner. First, the wheel bug grasps an insect using its two front legs and plunges a piercing proboscis into the victim. The bug injects the critter-turned-lunch with enzymes that not only paralyzes it, but also dissolves the internal organs. The wheel bug then slurps up the liquefied insides. 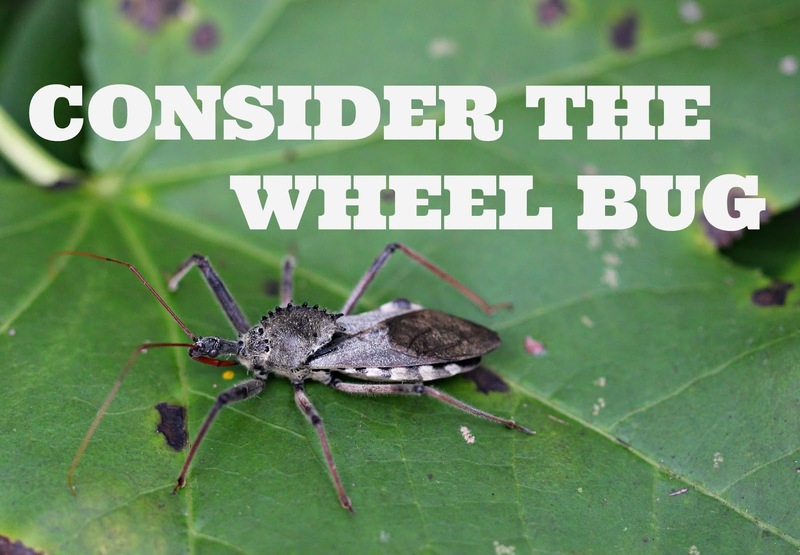 Gross and disgusting, yes, but the wheel bug is considered a beneficial insect since it preys on pests. 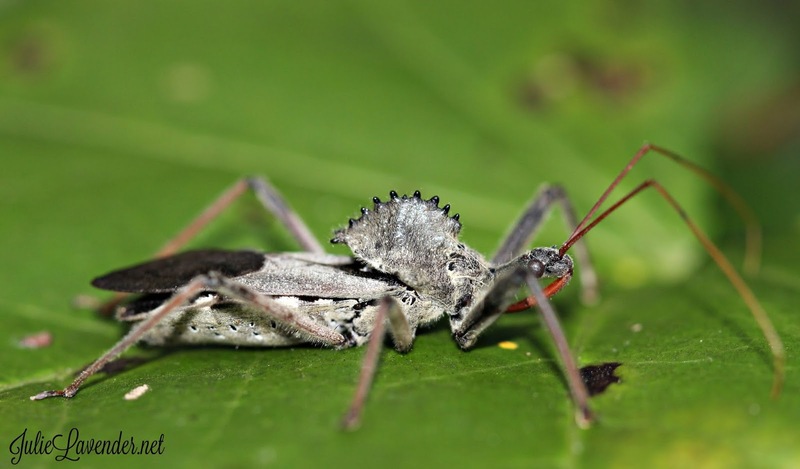 Though not a particularly aggressive bug towards humans, the wheel bug will bite when it feels threatened. And, it’s apparently a pretty nasty bite, too, causing intense pain and irritation. The wheel bug gets its name, obviously, from the crest on top of the thorax. Interestingly, though, biologists don’t seem to know just exactly why the spoked crest is part of the bug’s anatomy. The wheel bug is the only insect in the United States with such a crest, but no consensus on the crest’s purpose has been established. That aspect of the wheel bug makes me smile and appreciate God’s creativity even more. Did God give it a wheel just to make us ponder? Does it have a purpose that God’s kept secret all this time? Did He like the idea of pointed, teeth-like knobs protruding from the top of the bug? I love the lessons God teaches me through His creations, but I’m also okay with not knowing things. I think there’s much He wants us to know, but I believe there are some things we won’t know this side of heaven. 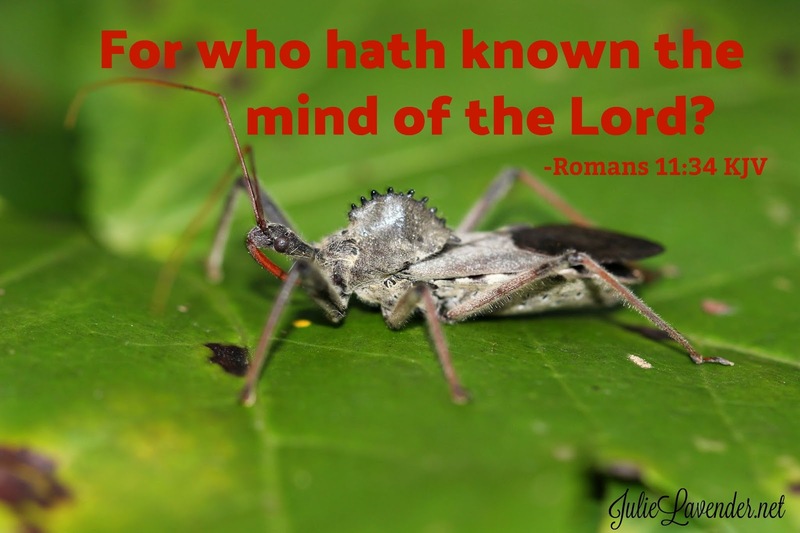 And maybe a wheel-shaped crest on top of a bug happens to be one of those unknowns! What about you? 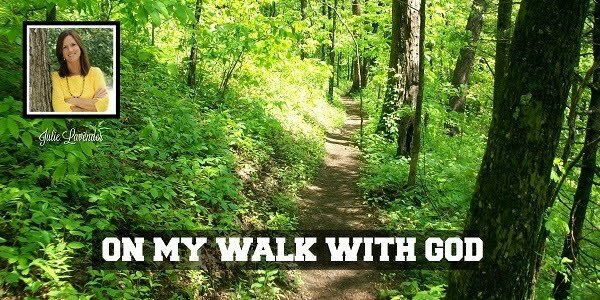 Is there something about one of God's creations that puzzles you? Oh, yes, the WHY definitely puzzles me!!! Horse flies and deer flies pester us terrible during the summer when we walk! I do despise them, for sure! 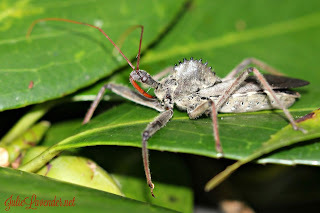 The wheel bug is an interesting looking guy, and I'm so curious about the whole wheel thing! It gives him such character!